For the third time this season, Courtney Force drove her Chevrolet Camaro funny car to the winner’s circle, coming from the top qualifying spot to beat teammate Robert Hight in the all-Camaro final round. Coming into the Menards NHRA Heartland Nationals presented by Minties in Kansas, Courtney Force was sitting in the top spot in the 2018 funny car title chase and from beginning to end – things only got better in Kansas. For the third time this year, Force and her Camaro went from the top spot on the ladder to the winner’s circle, turning in the quickest ETs in both qualifying and eliminations as she dominated the field. Courtney Force was the fastest funny car off of the trailer, laying down a 4.022 at 307.51 in the first round of qualifying to grab the top spot. In the second round of qualifying she ran a 3.91 at 321.73, which was the quickest of the round, putting her back in the top spot and that run would hold up through the final two rounds of qualifying. Qualifying didn’t go quite as smoothly for the other drivers in John Force Racing, with Robert Hight settling for the 14th starting spot while John Force himself drove his Camaro to the 11th spot on the starting ladder. 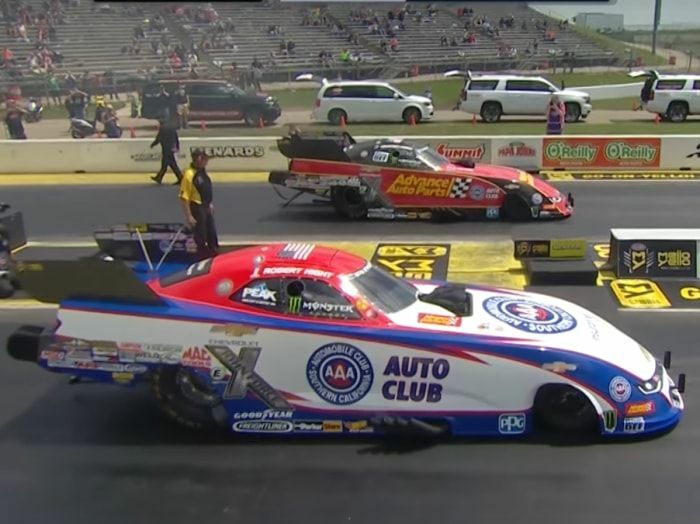 In the first round, Courtney Force and her Camaro made short work of Richard Townsend and Robert Hight beat #3 qualifier Cruz Pedregon to advance to the second round. On the other hand, John Force dropped his round #1 race to Tommy Johnson Jr. In the second round, Courtney Force and her Camaro turned in the second-quickest run of the round while beating Matt Hagan in his Dodge Charger. The quickest run of the second round came from Robert Hight in his Camaro as he beat Tommy Johnson Jr, sending the two Camaros into the semifinals where they would face a pair of Toyota Camry funny cars. Courtney Force and her Camaro took on JR Todd and his Camry. Coming into this race, both Force and Todd had won two races earlier in the season, so this was a clash of class frontrunners. Knowing the importance of the run, Force laid it all out, pulling a much better reaction time than Todd and running a 3.895 at 330.39 miles per hour. That was the quickest run of the entire event from a funny car and it sent Courtney Force into the finals. On the other side of the bracket, Robert Hight went head to head with Shawn Langdon, with the Camaro driver grabbing a small starting line advantage before turning in the second-quickest run of the event with a 3.911 at 330.55 – equaling Courtney Force’s qualifying time. This set up an all-Camaro final round between the two quickest cars in the field. Robert Hight grabbed a tiny starting line advantage (.062 to .068), but when he ran into engine troubles on the top end, Force cruised to victory with a 3.92 at 329 miles per hour. You can watch the final run in the video below. With her third win of the season, Courtney Force now holds an 80-point lead over second place Jack Beckman. Matt Hagan is 130 points back in third, Robert Hight is 158 points back in fourth and JR Todd rounds out the top five, 166 points back of the leader.